Student Placements – when one size doesn’t fit all. As any student is aware, there is only so much you can learn in the confinements of University. It’s all very theoretical with a lack of opportunity to apply the abundance of newly gained knowledge. Thankfully there are a host of growing and developing companies out there willing to offer students an opportunity to challenge themselves in new ways during the summer break. Fortunately I was granted the opportunity to work within a fast growing and reputable consultancy company, Maritime Assurance & Consulting. I can honestly say I’ve been able to experience a succession of unique work which has varied extensively throughout my summer. Having previously experienced a summer within a large service company, it would be fair to say that the extent of work experienced within MAC has been far more expansive. Because of this I’ve been able to not only build upon the skills which I already possessed but gain many more. Examples of this include gaining an insight into Dynamic Positioning (DP) which is an extensively utilised technology in the offshore industry, the ability to produce 3D designs of complex offshore structures, generate and evaluate RAO’s (Response Amplitude Operator) which are used to determine the likely behaviour of a vessel when operating at sea and finally my social skills, partaking in a number of meetings with clientele. Additionally I found working within a relatively small organisation very advantageous as this has allowed me to work very closely with a number of very experienced engineers. I gained some invaluable knowledge because of this, as they spoke of their vast experiences with me, sharing the “do’s and don’t’s” of the industry. Furthermore I feel that having a smaller team promotes outstanding team-work and inadvertently contributes to unquestionable communication levels. It’s then no surprise that MAC was recognised at the 2012 Grampian Business Awards, winning the ‘Business Success – Under 3 Years’ category. On a final note, any aspiring engineer should seriously consider gaining experience working within a consultancy company. This will enable them to broaden their range of skills, knowledge and engineering abilities through working on a vast range of projects at any one time. 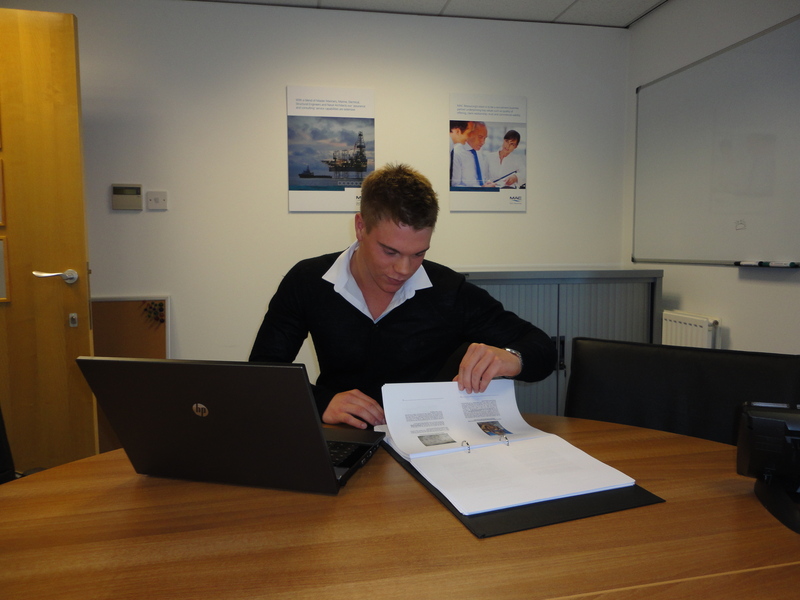 This Blog Post was contributed by Grant Singer, M Eng Mechanical Engineering Student at the University of Aberdeen who is currently undertaking a Summer Placement with Maritime Assurance & Consulting. Feel the fear and ……..